Every body can dance…but not everybody is ready to get out on the dance floor and do it. Founded by Marina Wolf Ahmad with a single day-long dance clinic in the San Francisco Bay Area in 2000, Big Moves is the only service organization in the world dedicated to getting people of all sizes into the dance studio and up on stage. For over a dozen years, we have been creating a safer, welcoming, body-positive atmosphere where people of all shapes and sizes can train in dance technique and perform onstage as part of a dance company…and have a whole lot of fun doing it! 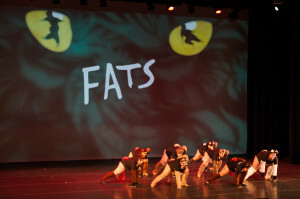 We are committed to centering fat people within our organization; our programs include training, choreography, and full-length dance productions by and for fat people. Our shows present a vision of a world transformed, where exciting performances can and do come from artists who resist narrow dance-world norms….and narrow dancewear options. Over the years Big Moves has had branches on both coasts, was home to several dance companies, hosted classes in everything from burlesque to aerial dance, and produced dozens of shows. Big Moves produced and was home to the six-season professional modern dance concert, Bodies in Motion, and co-produced a number of Original Fat Bottom Revue burlesque productions with the late Heather MacAllister of Big Burlesque. Our dancers have been featured in photo essays, local and national news features, documentaries, and have been featured on on NPR, PBS, and Entertainment Tonight. Open rehearsalswith emFATic DANCE, most first and third Saturdays of the month in Berkeley, CA. A Taste for Dance in October, a chocolate tasting and performance showcase featuring emFATic DANCE and special guests. Big Moves and all its programs are LGBT-welcoming and gender inclusive. We have a strict No Diet Talk policy in our rehearsals and workshops. Big Moves is a volunteer-run, not-for-profit organization and a fiscally sponsored project of Intersection for the Arts, a 501(c)3 organization. We rely on our annual fundraising events and other monetary donations to fund our programs and all donations made to Big Moves are tax deductible to the limits of the law. To donate to Big Moves please visit Intersection for the Arts’ donation page and click on Big Moves in the list of current members and you can donate from there. We are always looking to expand our pool of volunteers and if you are interested in donating your time, skills, or resources please contact us. We’d love to meet you! See a detailed history of Big Moves and review our past events. Learn more about emFATic DANCE, including booking information and how to become a member. See us at our most flabulous! Check out our photo gallery. *From 2001-2011 emFATic DANCE was known as the Phat Fly Girls/Phat Fly Girls-West Coast. To learn about our name please go here.